Message: Thought you might be interested in this 1966 Chevrolet Chevy II Nova. 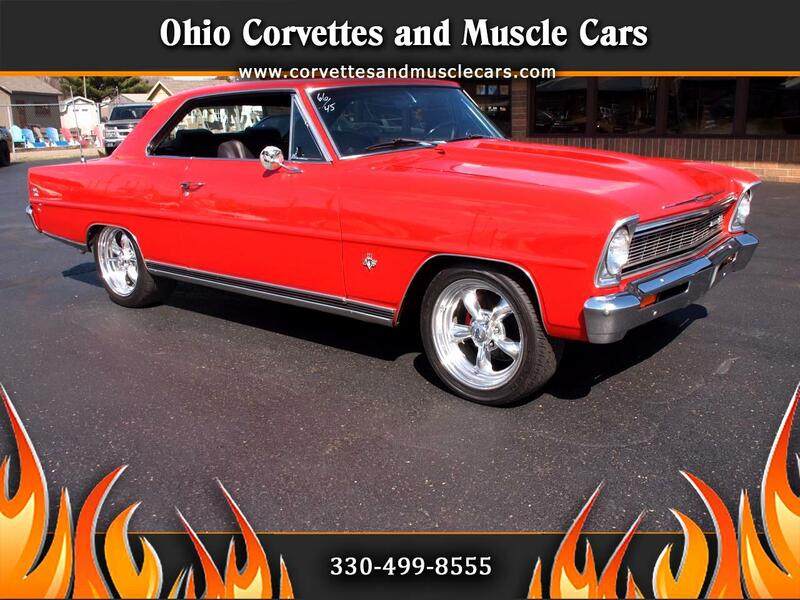 Ohio Corvettes and Muscle Cars is proud to offer this beautiful 1966 Nova Super Sport for sale. If you ever wanted to make a case for re-sale red...buddy...this is your car. This is a true SS, but has been resto-moddded to make it more compatible with today's driving needs...and going fast. It's power comes from a fresh Chevrolet 350 crate engine putting out 350 horsepower. and a Turbo 350 automatic transmission with a Hurst shifter. Transferring all this to the rear wheels is a 12 bolt rear end with posi-traction, and 4:10 gears. Further enhancing the driving experience are power steering, 4 wheel disc brakes, power driver's seat, tilt steering wheel (on a beautiful chrome steering column), a custom bucket seat interior, and Vintage Air. And, finally, giving this car a wicked cool Old School look are the Crager Mags with spinners. This car is ready to go...it doesn't need a thing to begin enjoying the Cruising Season. Mechanically it is A-1 and you will be riding on a strong rust free body and chassis. Give us a call and talk to us about your next new toy.